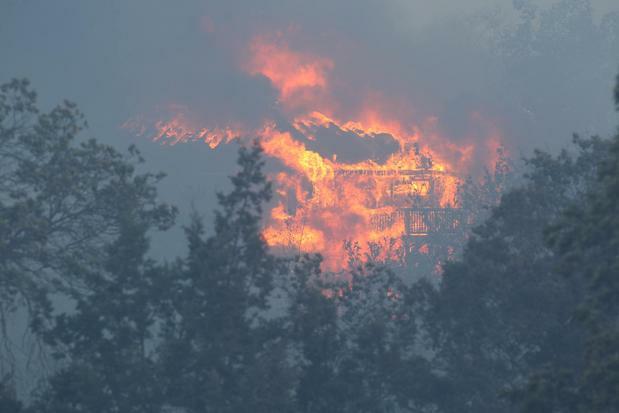 The Texas Forest Service is reporting that a total of 1,626 homes have been destroyed by wildfires across Texas in the past seven days. 1,386 of these destroyed homes were from the Bastrop fire. The other 240 destroyed homes are from other fires raging across Texas. The areas hardest hit at this time are near Austin, near Houston, and in northeast Texas. Twenty new wildfires were reported yesterday. These new fires cover approximately 1,422 acres. There are currently 126,844 acres burning across the state of Texas. Our organization spent the majority of the day visiting the Command and Control Center in Bastrop, Texas. We also visited the largest shelter in Bastrop in the Ascension Catholic Church. Thankfully, law enforcement, EMS workers, church workers and other volunteers were very open to discussion and offered detailed insight into the problems and needs of the families who have lost homes. The Command and Control Center indicated that clear and consistent information was the most needed of anything. Several tables of volunteers were busy helping people with paperwork, counseling, and animal placement. They were stocked up on supplies. Discussions with law enforcement revealed that approximately 500 ground firefighters were working on the blaze which was stated to be at 30% contained — a number that had not changed in twenty-four hours. They stated that the firefighters were well supplied with water. Law enforcement also indicated that live powerlines were a significant threat at this time. One officer told us that a local electric company crew had been trapped by the fires and had to be rescued by helicopter. The shelter at the Ascension Catholic Church was also well stocked. The director of operations was kind and willing to discuss the circumstances they were facing. Initially, the director stated that they were overstocked on any needed item and were turning away any more supplies. When we inquired about any lower-income communities or churches in the area, we discovered that many of them didnt have enough resources. We suggested to the director that he might consider accepting resources and delivering them to the smaller churches and lower income communities. Our experiences with disaster response tend to show that well-intentioned disaster area leaders frequently do not have good lines of communication with each other. Therefore, tomorrow Citizen Patriot Response will contact all church leaders in Bastrop county and attempt to assess the needs and encourage more communication and cooperation between these groups. In addition, we will attempt to visit the Spicewood, Texas area and assist local efforts in any way needed. Their fire destroyed 38 homes. The local 9-12 group from Dripping Springs, Texas and the Cedar Park 9-12 group have been leading the efforts in that region to address the needs of homeowners who are now in need. We received calls and emails from many individuals and groups today from across Texas. They offered support and facilities for collecting resources. This is both kind and wise due to the threat of wildfires across the state. This organization strongly recommends for each region to have a planned site to gather or obtain aid. Tea Party, 9-12, and other liberty-minded groups should plan ahead and contact us regarding a possible future fire in their area. My relationships within law enforcement indicate that the possiblity of terrorist attacks on 911 are likely to be from a 25 cent book of matches. Our state is very dry — read very vulnerable right now. It is also important to remember that many far-left of center activists in Texas openly advocate for the use of arson to damage our state — as was the case with our governor’s mansion. It is imperative for Texans to be prepared to help each other. Though clearly the average citizen is unable to put out a pine forest fire, many of our state’s fires are in fields. Therefore, Tea Party, 9-12, and other liberty-minded groups should consider keeping a supply of shovels for helping stop fires and bottled water for hydration. Texans having a shovel in their truck bed or car trunk would be wise. Unfortunately, it is common for people to stand around a small fire as it spreads and wait for firefighters to handle it. We would like to remind Texans that dirt thrown on fire is a good solution. Though FEMA might be inclined to dislike citizens helping to stop fires themselves, we find it unlikely that the image of thousands of Texans with shovels being told to let their state burn would be feasable for them. Please expect more updates as we visit and assess the needs of the numerous areas in Texas with fires currently or recently damaging the homes of families. Please expect more calls to action as well — Though we have been trained to wait for government to help those in need, we can do a lot for each other. As always, if you or your organization is trying to help others and needs help — please contact us. We will by no means turn you away. This article was very informative and the work you are doing is to be commended. Your advice about helping each other is right on the money. If someone can help, help. Fighting small out breaks of grass fires can be stopped with enough people and shovels . Tall grass might be different but there is not much of that around. Great work!! Thanks to you all and God Bless!